Back in the 70's, to speak of utopia was to speak of a more egalitarian society, in which social classes and individualities were barriers to be overcome. 40 years later, to speak of utopia is to speak of the interwoven structure according to which our by-no-means-egalitarian society has modelled itself. A structure constituted and inhabited by the most diverse visions of reality, simultaneously evolving in directions and towards goals still unknown to us. This profound change has created a new situation within the world of art, as it has throughout society as a whole, a situation that we cannot remain indifferent to. Consequently, we approached Lola Donaire, art historian and critic, to request a synthetic account of these new realities. 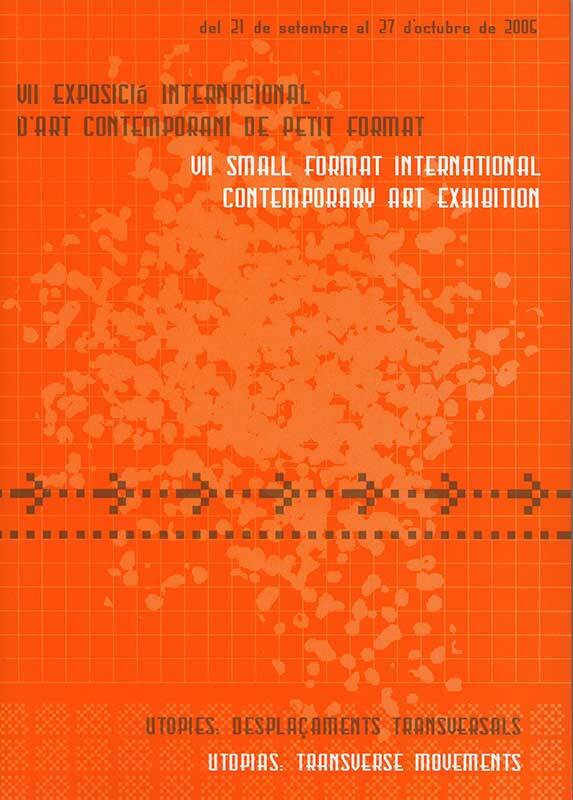 A brief but clear extract of her thoughts gave MX Espai 1010 the underlying pretext for the International Small Format Exhibition, in its 7th edition. To avoid this being perceived as theoretically disproportionate requires the statement that we regard this type of work (art in small sizes) as an exercise in conceptual intensity. Furthermore, we wished to create a common meeting ground for artists from all over the world, an inevitable allusion to the inhabitants of our beloved planet, whereby a subsequent debate could be held between the artists and the author of the text. Once again, we had the agreeable surprise that our invitation was accepted by artists of the level of Joan Cruspinera, Utte Kollwitz, Cecilia Gutierrez, Carmen de la Calzada, Carles Hac Mor, Anne King, Ester Xargay, Almira Olmayán, Carles Martinez, Kioko Kumai, Col.lectiu Puntes, Asunción+Guasch, Ursula Gerber-Senger, Carlos Pina, Maria Cosmes, Peter Bloom, Harald Klein, Marcos&Marcos, Mireia Clotet, Goro Nagano 0 Fabiola Ubani all of whom responded to this year's proposal with a three-dimensional object of the quality they are known for. Likewise, young artists who's production shows outstanding promise, and others who are showing with us for the first or second time, such as Victoria Maluf, Ana Casal, Cecilia Postiglioni, William George, Carmen de los Llanos, Ade Boyle, Antonia Gallardo, Anne Moreno, Kerstin Vegelah, Luisi Gimenez, Lupe Vargas and many of them from abroad, have submitted works that add to the diverse standpoints and always welcome complexity of the exhibition. The result has fully satisfied our expectations for this edition. We have been able to display works in traditional techniques, in which weaving is an intrinsical part of the idea to be revealed; other multi-media works develop new ideas in which an essential part of the discourse is the weaving of conceptual matter; in either case, works at the cutting edge of a ground shared by the artists who have, once again, backed the project of MX Espai 1010; a project that takes us, year after year, to confront the new challenge.